The photograph taken from the windows of Enola Gay, the B-29 U.S. aircraft flying away from Hiroshima after dropping ‘Little Boy’ – the first atomic bomb to be used against a populated city – is a well-known, haunting and lasting image of the devastation developing just under it. The cloud rises over the city after the atomic bomb detonated only few moments before, at roughly 180 meters (590 feet) directly above a side street of modern day Hiroshima. 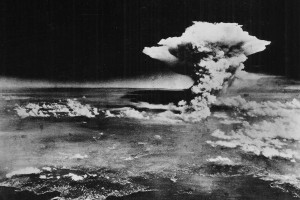 Less known are the images of the atomic mushroom as these were experienced from below, by the citizens of Hiroshima. 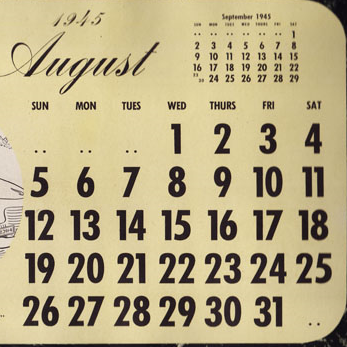 Hiroshima Peace Memorial Museum preserves several such images. 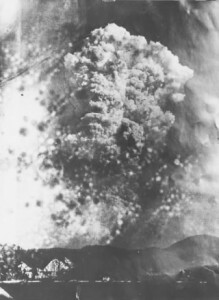 Yamada Seiso took the lower-left photo from his home near Mikumari Gorge only two minutes after the explosion, making it the earliest image of the atomic bomb. According to records held by the U.S. military, the cloud billowed to 9,000 meters in the sky within three minutes of the blast. 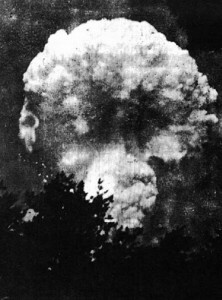 Apart from Yamada’s image, which clearly presents the mushroom shape, images taken from positions much closer to the hypocentre reveal the blast as a huge smoke cloud, blocking the sight, flattening the space and any objects within it, creating a sense of opacity and disappearance into invisibility, holding fear and awe in the presence of the incredible sound and flash of the bomb. In Japanese this has become to be known as the Pika (flash of brightness), Don (sound of the detonating bomb). 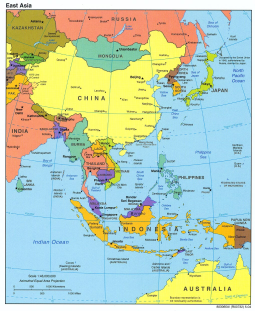 Another point of view (lower right) comes from Kure Naval Arsenal, now the Japan Coast Guard Academy, just outside the city, where Oki Masami took this photo. Records made by the Japanese military indicate that it looked as if something was burning within the atomic cloud, with strong sparks and flashes that gave a view of a grand fire within the smoke cloud. The atomic cloud over Hiroshima taken by Masami Oki from Kure Naval Arsenal. The brightness to the left is explosions within the cloud.